*Read entire manual prior to unit installation. The EZ-Pull dock leveler design offers a tremendous ergonomic solution when compared to other available dock leveler designs. The simple, smooth performance and easy to position lip eliminates the lifting and difficult positioning factors associated with hook type designs. The Latch assembly, of this model, allows the operator to easily position the unit by pulling then pushing the handle causing it to glide forward. Retraction and storage of the unit after use is automatic once the truck pulls away from the loading dock; the leveler can be manually closed while a truck is still at the dock position by pulling the leveler arm back until the lip falls then push the handle forward to complete the cycle. 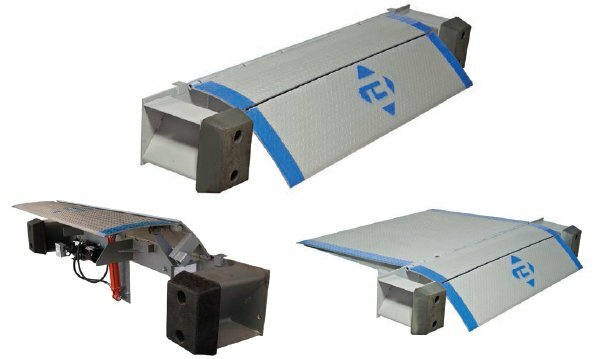 The Edge of Dock Leveler will accommodate a maximum of 5 inches above the dock and 5 inches below dock, providing 18.5% grade down an 20% grade up. This is acceptable for most Gas or Propane Forklifts, but is not suitable for most pallet trucks or many electric forklifts. Freight trailers range in height from 46 to to 56 inches; therefore the dock leveler should be mounted at 51 inches above the driveway. Refrigerated trailers range in height from 50 to 60 inches; therefore the dock leveler should be mounted at 55 inches above the driveway. In addition, this application requires a reefer lip (17" lip length) to accomodate the offset floor of the trailer. Flatbed trailers have a wide range of trailer heights. Dock Boards or other equipment may be needed for extreme variations. Containers have variations in both floor heights and door configurations. Captive Fleets require mounting midway between highest and lowest trailer, provided ±5 inch range is maintained. ​Pallet trucks and electric forklifts can be used with trailer 3 inches above and 3 inches below dock level. Dock Boards or other equipment may be needed to accomodate a greater service range for pallet jacks and electric forklifts. This is due to limited clearance and grade-ability of that equipment. Edge of dock levelers WILL NOT accomodate refrigerated and freight trailers at a single dock location due to limitations specified above. Mount sperate Dock Levelers at different heights to handle both types correctly. Mount dock leveler with reefer lip at 55" and use wheel risers to raise and lower trailers. Declining and inclining drives require special dock specification. call 1800-741-1258 for more information. The edge of dock leveler is designed with a fully hinged lip utilizing a torsion spring counterbalance assembly for ease of positioning. This unit conforms to OSHA and US Department of Commerce standard CS-202-55. The Edge of Dock Leveler has a 5" above and below dock surface operating range for propane and gas trucks and 3 inches above and below dock surface operating range for pallet jacks and electric forklifts. Unit is also designed to float allowing for vertical corner deflection when lip is in contact with truck bed. Positioning tabs ensure correct height placement on dock surface during installation, effectively making the this model the easiest to instal in the industry. READ AND UNDERSTAND ALL SAFETY PRACTICES AND OPERATING INSTRUCTIONS before installing, servicing or operating the dock leveler. Failure to do so could result in damage to unit, property, and personnel injury to operator. Do not stand between leveler and truck backing up to dock. Do not operate the leveler with equipment, material or people on the deck section of the leveler. Do not stand or travel across the leveler unless lip is placed securely on truck bed floor. Never attempt to work under the dock leveler without properly securing the front and center sections. Keep clear of dock leveler while in operation. If dock leveler is not operating normally, discontinue use. Request maintenance personnel to inspect and contact Loading Dock Supply at 1800-741-1258. Keep clear of all pinch points that could cause injury. 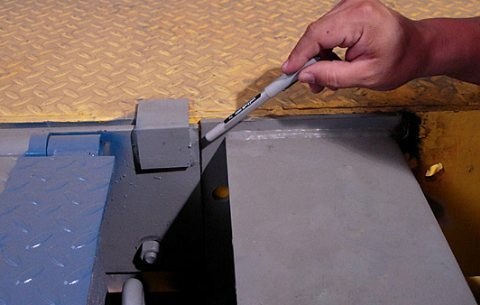 Damage to leveler could occur if product is misused or used in an abusive manner. For additional information or concerns, contact your Loading Dock Supply representative 1800-741-1258. The edge of dock leveler will provide years of efficient operation if properly maintained. Preventative maintenance should be performed every six months or as needed for normal usage. For efficient operation and proper maintenance of levelers used for multiple shifts (above normal usage), maintenance should be performed every 30 days. Cleaning: Check hinge tube areas for any debris. Clean hinges with wire brush to remove any foreign objects. Grease: The unit should be greased twice a year or as needed -- grease zerts are located underneath the deck of the leveler. Structural Check: Check unit for any obvious structural wear. Check hinge tubes for any signs of cracking or wearing. Spring Assembly: Check spring assembly to assure a proper float in the leveler deck. Check spring linkage rod for any signs of bending. Handle Check: Check handle for any signs of bending or cracking. Improper handle bend may result in the unit not latching properly. Latch: Check the latch and latch catch for signs of wear on surfaces. Too much wear can decrease height up allowance and may keep latch from disengaging. Any damaged parts should be replaced immediately and can be purchased from loading dock supply at 1800-741-1258. By design all Levelers offered by Loading Dock Supply are modular allowing for adjustment for low dock, hydraulic, and bumper retrofitting. CAUTION:STAND CLEAR OF UNIT WHEN CUTTING STEEL BANDING. NOTE: REMOVE HANDLE AND BUMPERS BEFORE BEGINNING INSTALLATION. 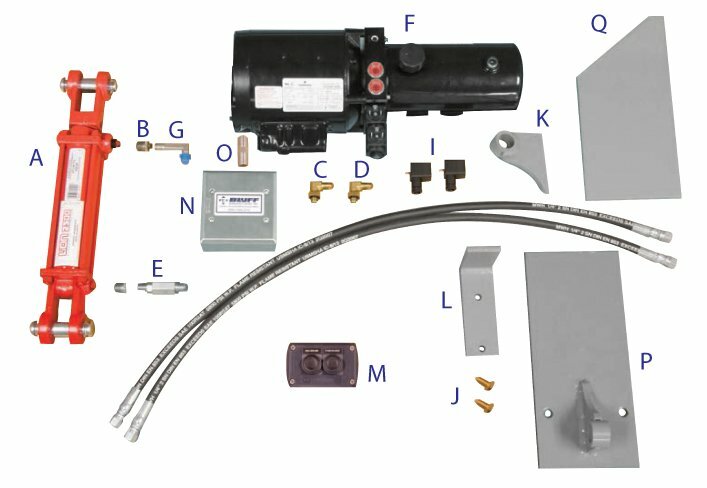 ​ Handle is attached to mount plate for shipping purposes only. 1.) Check straightness of imbedded channel with plumb line. If out of alignment shimming may be necessary. Any out of align,alignment condition will result in a binding problem. 2.) Clean and prepare surfaces for installation. 3.) Center the dock leveler against the dock with the positioning tabs resting on top of the imbedded channel. 5.) Shim where necessary to keep leveler straight and plumb. 6.) Weld out the top of the mount plate from center out to the edges and down the vertical sides. 7.) Position the bumpers flush with the top of the mount plate and butted up to the sides of the mount plate. 9.) Mark the bottom hole location of the bumper beam, drill an anchor hole and install a 3/4" x 4" wedge anchor bolt. 10.) 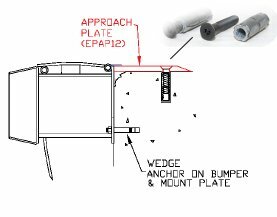 Re-position the bumper on the dock and weld to imbedded channel and secure the bottom of the bumper anchor bolt and nut. 11.) Re-grease the unit as welding may burn out some grease in the hinge tubes. 12.) Re-paint any burned areas, rustoleum smoke grey (7786) or blue (7727) aerosol. 13.) The latch is factory installed with notch against mount plate. 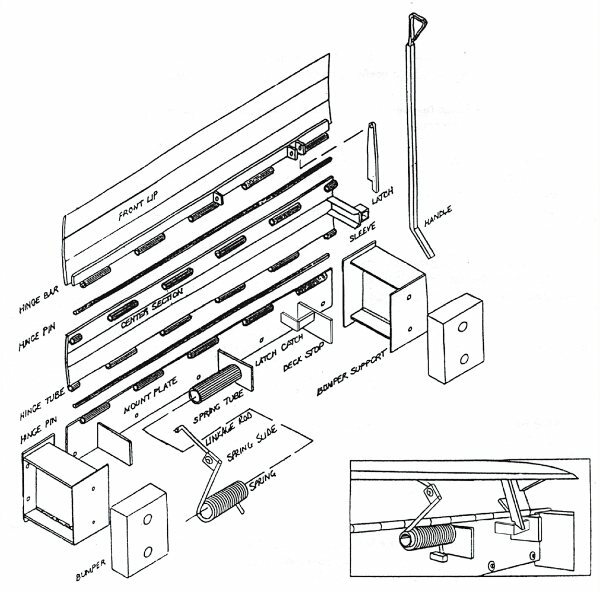 Latch should swing freely when leveler is in its rest position. 14.) 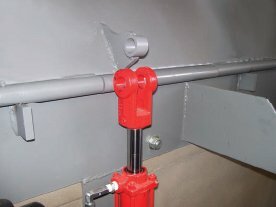 Remove bolt from bottom of handle and position handle into sleeve with bend facing away from dock face. Re-install bolt and nut into bottom of handle. 15.) Test unit for correct operation. NOTE: REMOVE HANDLE AND BUMPERS BEFORE BEGINNING THE INSTALLATION. 1.) Dock without imbedded steel channel require the installation of an approach plate, such as our EPAP12C model. 2.) Center the beveled approach plate in the desired location flush with the dock face. Cut if required to fit door opening. 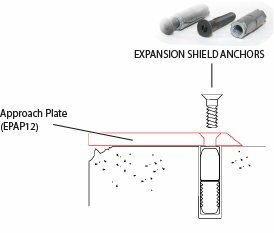 An approach plate requires 5 heavy duty expansion shield anchor bolts with 1/2" flat head socket cap screws, such as those found in our EPAP2 and EPAP3 fastener kits. Locate the approach plate and drill pilot anchor holes with a 9/16" concrete drill bit. Remove approach plate and drill over anchor holes with a 7/8" concrete bit. Install expansion shield into holes (insert with threads on the bottom). Re-position approach plate and anchor. 3.) Center the Dock Leveler against the dock with the positioning tabs resting on top of the approach plate. 4.) Tack the top of the mount plate at the center to the approach plate. 6.) Drill 3/4" anchor holes along the mount plate and install 5 each 3/4" x 4" wedge anchors. 7.) Weld top of mount plate to approach plate with a continuous weld from center out. 10.) The latch is factory installed with notch against mount plate. Latch should Swing freely when leveler is in its rest position. 11.) Remove the bolt from the handle and position it into the sleeve tube with the bend facing away from dock face. Re-install bolt and nut into bottom of handle. 12.) Test unit for proper operation. Step 1: Pull the EP handle up until the dead bolt hits the bottom of the 2" square tube sleeve. Step 2: Pull the handle back until the latch mechanism falls into catch position. Step 3: Push the handle forward to extend the unit outward toward the truck bed. Step 4: Continue to push forward until the front lip rests fully on the truck bed. Step 5: Return the handle to its rest position while in use. Step 6: When returning unit to stored position, repeat step 1. Step 7: Pull back on the handle until the front lip clears the truck floor, once the lips falls allow the weight of the leveler to drop the unit back into its rest position. Step 8: Return handle to its rest position. ​When I raise the dock leveler the front lip does not extend outward. Check to ensure latch is attached to unit. Check to ensure latch notch is facing the dock. ​Check latch assembly for damage or excessive wear. When I raise the dock leveler the handle hits the dock surface. Check to ensure the handle is positioned correctly in the holster. Handle and bend facing away from dock face (toward trailer) when in stored position. The leveler will not raise enough to allow latch to catch. Check for proper tube clearance. Tubes should be 1/8+" higher than dock surface. Deck needs to rotate to approximately the one o'clock position. Check hinge tubes for any debris. Wood, nails, etc. can prevent proper rotation. The leveler is difficult to raise and lower into position. Check hinge tubes. Clean any debris or foreign objects from hinges. Use wire brush if necessary. Check hinge tube lubrication. Grease unit thoroughly. *Important: Specify model number and serial number when ordering parts. 1.) Prior to mounting, refer to EZ-Pull dock parameters and mounting instructions for mechanical edge-of-dock levelers or lo-dock leveler for mounting the leveler unit. 2.) Lift the lip of the EZ-Pull leveler to expose brackets as shown below. 3.) Anchor mount plate as shown below. 5.) Mount the MPOWERUNIT on the pump mount bracket EPPMBKT. 6.) Mount the MHYDCYLINDER onto the lower bracket EPHLBKT. 7.) 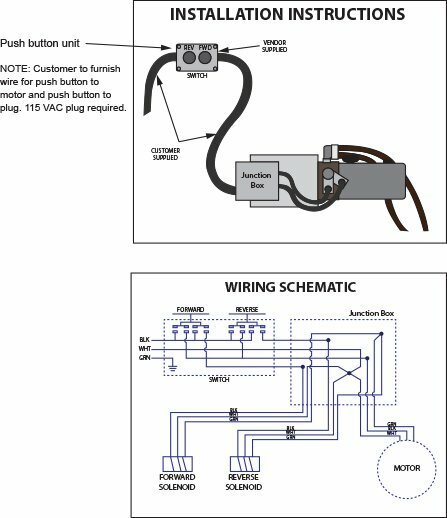 Install and connect hoses as shown below. 8.) Mount the switch (MPUSHBUTTON) on the interior of the building wall. 10.) Power the MPOWERUNIT and jog the motor to test wiring. 12.) Carefully lower the lip to its rest position. 13.) Press the forward and reverse button to complete a full cycle. 14.) Refer to the trouble-shooting guide if unit does not function properly. Step 1: With truck back into position and trailer door open, depress the reverse button until the latch falls into position. See Illustration Below. Step 2: Once the latch falls into position, release the reverse button and depress the forward push button. Step 3: The front lip will begin to extend forward, continue to hold the forward button until the front lip rests on the truck floor or the latch kicks off and the front lip lowers onto the truck floor. 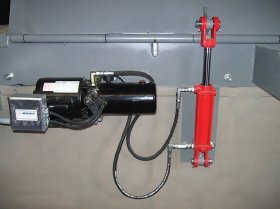 Step 4: To return the hydraulic leveler to its resting position, for proper storage, depress the reverse button until the front lip clears the truck bed and raises into a vertical position. Step 5: The hydraulic fluid will return to the tank. The deck section will slowly lower to its resting position parallel to the dock face. Note: when leveler is not in use, keep lowered, stored position. NOTE: The leveler selected for the retro-fit hydraulic package must be in acceptable working condition. 1.) Lift the front lip of the Dock Leveler to expose the brackets as shown below. 2.) Remove the spring assembly leaving the deck stop and gusset. 3.) 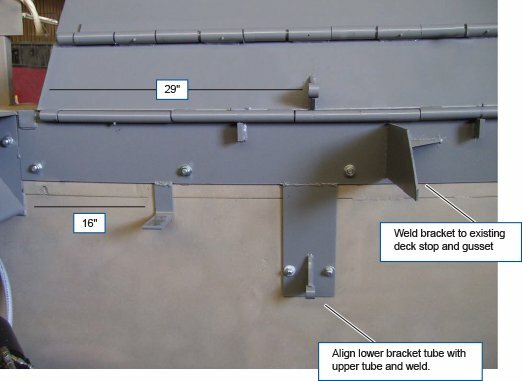 Clean the surface and weld the brackets as shown below. 4.) Anchor the lower bracket to side of dock. Faulty hose, damaged value stem.